The olinguito is a 2-pound member of the raccoon family – with a face like a teddy bear – that lives in the cloud-draped rainforest canopies of Ecuador and Colombia. RALEIGH, N.C. — Even with so much of the world so thoroughly investigated, a trio of scientists say new discoveries do, occasionally, still grow on trees. A researcher at the North Carolina Museum of Natural Sciences is part of a small team that announced Thursday it had identified the Western Hemisphere’s first new carnivore species in 35 years. The olinguito — pronounced oh-lin-GHEE-toe — is a 2-pound member of the raccoon family that lives in the cloud-draped canopy of mountaintop rain forests in Ecuador and Colombia. In scientific terms, “It’s really cute,” said Roland Kays, director of the biodiversity lab at the state science museum and a research associate professor of mammalogy at North Carolina State University. He helped track down the nocturnal olinguito in the wild. 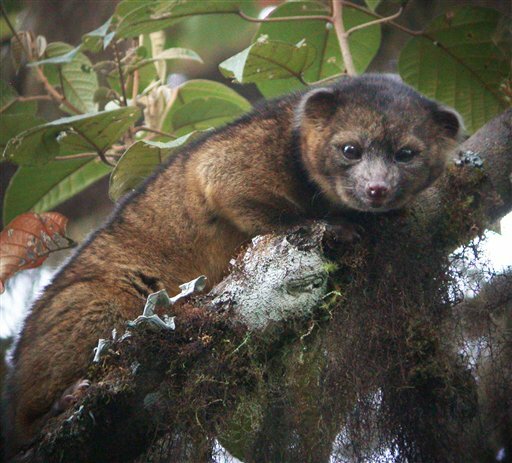 The olinguito has reddish-brown fur and a long tail with faint rings. “It looks like a cross between a housecat and a teddy bear,” said Kays’ colleague, Kristofer M. Helgen, a zoologist at the Smithsonian Institution in Washington, D.C.
Kays, Helgen and Miguel Pinto, a zoologist in Ecuador, published their findings on the olinguito Thursday in the journal ZooKeys. They simultaneously announced the discovery in a YouTube video produced by the online site Untamed Science, and introduced a stuffed rendition of the critter, suitable for cuddling. The first 20 of the toys offered at the Museum of Natural Sciences’ downtown gift shop disappeared fast, as Kays say the real animals do in their native habitat. “They’re sneaky,” he said; they dart about the 100-foot-tall treetops at night, obscured by leaves and branches and the ethereal mist of the Andean cloud forest. It’s easy to see how scientists might have overlooked them for so long. In fact, several specimens had been collected and preserved in science museums around the country, but most had been miscataloged as olingos, their larger, more common kin. Helgen came across some of the dusty specimens while he was studying olingos, and noticed these stood out for their smaller size, shorter snouts and different teeth. One even had a note on it from a scientist who suspected at the time it was a different species but apparently never followed up. Helgen consulted with Kays, who had become an expert on olingos while he was a doctoral candidate. The curious carnivores got in his traps while he was trying to study the social organization of kinkajous. Kinkajous and olingos, along with raccoons, coatis, ringtails and cacomistles, all belong to the Procyonidae family. The scientists needed DNA comparisons to confirm the specimens represented a distinct species. Kay said it’s possible to extract DNA from decades-old specimens, but they could get better samples — and have more fun — trying to find live animals to collect and study. “We should go see if we can find them,” Kays told his colleague. Tags and notes indicating where the specimens had been collected led the researchers to the cloud forests of South America, those cool, damp rain forests so high in the mountains they’re almost always shrouded in mist. That’s higher ground than other olingos are known to inhabit. Kays and Helgen headed to the Otonga Reserve in Ecuador, where they were joined by Pinto, who had managed to capture grainy, nighttime images of the elusive creatures. “Sort of the Sasquatch video of the olingo world,” Kays said. Their first night out, they saw them, high above, working the treetops and feeding on tomato-sized figs that grew there. They collected two of the animals; one stayed in Ecuador for study and one was brought back to the Smithsonian. DNA testing proved the animals’ distinctness. All that remained was for the team to name the olinguito — “little olingo” in Spanish — and publish their findings. “It’s the discovery of a lifetime,” said Kays, 42, who came to the museum a year ago and constantly looks for ways to use technology to teach museum visitors about biology. One of his projects there is a video loop from a hidden camera that captured nighttime images of forest creatures. An exhibit across the way from the lab where Kays works indicates how rare the team’s find is. It says that biologists have catalogued 1.8 million species so far, and while 15,000 new species are documented each yeur, most of those are insects and amphibians, or the occasional bat or rat. The Smithsonian says the last new carnivorous mammal found in the Western Hemisphere was the Colombian weasel, in 1978. Now that they know about the existence of the olinguito, scientists will want to study its habits, its shrinking habitat, its role in the ecosystem. But the wooly little beast already has taught the world something, Kays said.